I ran across an amusing ad recently, and because it's Positive Thinking Month here at Startled Disbelief, I decided to click on it rather than ignoring it as is my wont. If you've read about the Law of Attraction, maybe you're wondering why sometimes it works and sometimes it doesn't work. Hey, Joe: I'm also wondering why sometimes my coin stubbornly insists on coming up "tails" when I command it to come up heads. Luckily, I actually know this one. Sometimes it works and sometimes it doesn't, because you're not properly applying confirmation bias. If you take note of the hits and discard the misses ('cause you weren't doing it quite right), then it will work every time! But maybe Joe has a different answer. See, the movie just introduces the idea of the Law of Attraction; it doesn't explain the Law of Attraction, nor does it explain all the other elements and all the other laws that are out there in the universe that you need to know to create the life that you'd like to have. Good point. The Secret doesn't spend enough time talking about the other laws of the universe. I recommend starting here. The Law of Attraction is a law, it's like the Law of Gravity, it's working all the time. Yeah, they're exactly the same! One is a vague ipse dixit rule of thumb which claims that a person's internal psychological state can and does have a dramatic and direct effect on the day-to-day operation of the cosmos at a macroscopic level, and the other is a scientific theory that describes the interaction between massive bodies due to the curvature of space-time and is a foundational principle of modern physics. You see, there's something called counter-intentions in your life. You can consciously declare that you'd like to have, do, or be something, but if it doesn't happen it's most likely because you have an opposing belief, you have a counter-thought within you. Or maybe, just maybe, it's because magic isn't real. Just sayin'. Wait, did he say "it could be an old program"? Oh, no! Gaius, fire up the detector: I think that we might have a Cylon on our hands! Okay, perhaps I'm laying the snark on a little thick. Getting some of what you want in life... but not ALL of it? You CAN attract the things you want into your life. But ONLY when your subconscious thoughts MATCH your conscious desires. Honestly? I think that the greatest travesty here is that he used various combinations of boldface, italics, underlining, block capitals, and the colour red to make his point. 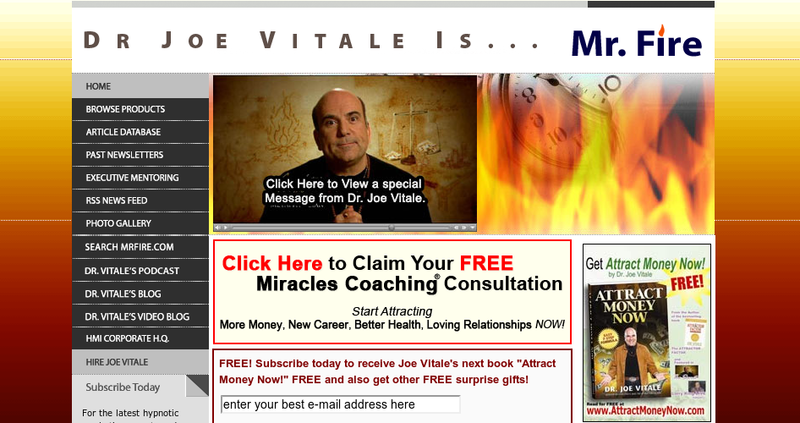 But... who is Joe Vitale? 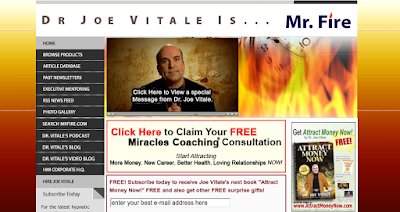 Well, according to the <title> tag on his website, "Joe Vitale of The Secret DVD is Law of Attraction expert and Life Coach". That image sort of makes him look like Satan, and calling himself "Mr. Fire" certainly doesn't help. Apparently he's a P.T. Barnum devotee (appropriate), a "Chun Kung Healer" (what? ), and has a "Doctors degree [sic] in Metaphysical Science" (awesome). NOTE: This is spiritual accreditation, not secular accreditation. (Secular means "non-spiritual"). Education at UMS is not a substitute for education at traditional or secular colleges. ... Your degree at University of Metaphysical Sciences is not transferable for credit at secular universities and is strictly religious in nature. ... You cannot attend UMS for the purpose of transferring credits among traditional secular colleges or for the purpose of getting federal grants or loans because the AADP and the AAMA are not recognized by the US Department of Education for that purpose. Most people in spiritual markets don't even know what accreditation is, let alone require it in someone who they are taking a spiritual class from or getting spiritual counseling from. Even a spiritually focused job at a retreat center or church is not going to require that your degree be accredited. Accreditation is completely unnecessary if you plan on working in the spiritual field. Well, we went farther down that particular rabbit hole than originally intended. Tune in next time, when I hope to discuss either The Secret or perhaps even negative thinking. * Although I make a concerted effort to avoid making "not a real doctor" claims (despite accusations to the contrary), it is easy to find examples of people who have misled the public with regard to their academic credentials. (Examples include "Dr." Kent Hovind and "Dr." Gillian McKeith.) Although I have not been able to determine conclusively where "Dr." Joe Vitale studied, I have my doubts that it was a properly accredited institution. "Honestly? I think that the greatest travesty here is that he used various combinations of boldface, italics, underlining, block capitals, and the colour red to make his point." But hon, that's the very best part of the internet! As in nature, distinctive colouration and markings let us know which insects to avoid. thank you for great article !